We are pleased to inform that Math SteelCave, our second math game for iOS, is now ready at the App Store, for iPhone, iPad, and iPod Touch. Achieving an interest in mathematics that reaches all ages is a primary goal for us. To that end, the company has developed a version of Math Combat Challenge specially designed for people aged nine years and older: Math SteelCave Challenge. 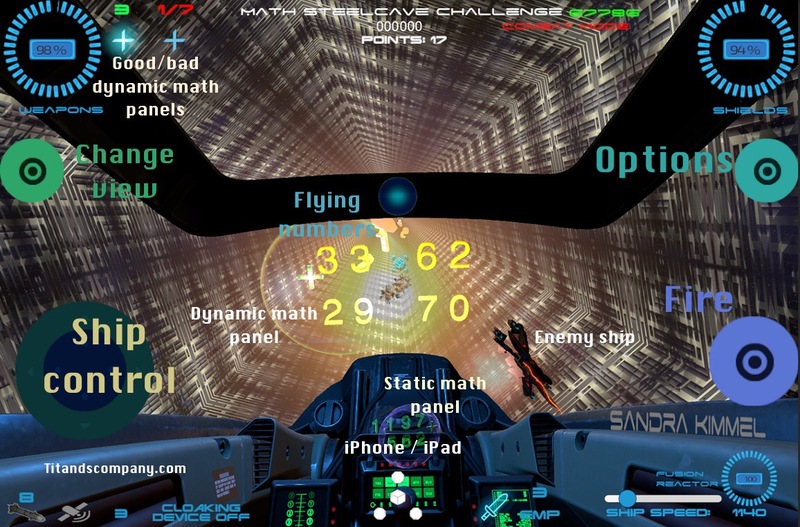 This version is located inside a powerful starship, within an infinite steel tunnel, where various obstacles appear, and also some elements, such as enemy ships or drones, which will try to prevent us from resolving the mathematical exercises with calm. The player will have to aim the ship to the numbers and shoot the lasers, solving the static and dynamic random panels, from sums to equations. Math SteelCave Challenge is designed especially at Aimed at young people from the age of nine, it is designed to be fun and challenging for all ages. We intend to create several modules with different possibilities and mathematical challenges, and this second module is specially inspired in space. If you want a game for children, we also have Math Classroom Challenge for kids aged 4 to 12. But we haven’t finished here, and we’re working on new titles to bring math to everyone. Have a great Math Day!